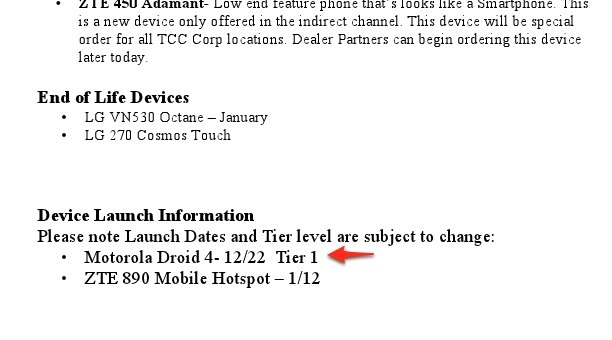 DROID 4 Still Set for December 22 Release? We were told a couple of weeks ago that the first “DROID” 4G LTE slider – aka the DROID 4 – has a better than average chance of hitting store shelves on December 22. According to a document that popped into our inbox today, that still appears to be the case. Now, we probably do not need to remind you that these things change, but again, these things can change. So if you were looking to harness the power of LTE on the 4th edition of the device that started it all, you could be in for a treat this Thursday. We just need Verizon to make it official. To recap the DROID 4, here are the official specs, how it compares to the RAZR, and a look at the accessory lineup that should be ready for launch.